Listening to the Qur’an being recited correctly is enough to soften even the hardest of hearts and Muslims and non-Muslims alike find it a deeply moving experience even if they do not understand what is being said. We feel this even more in Ramadaan when we are in the Taraweeh prayers and we can really feel the difference if we go to a Masjid where the Tajweed rules of Qur’an recitation are not being observed as they should. Every single Muslim has to recite Qur’an in Salah but many of us do not realise that reciting the Qur’an correctly, observing the rules of recitation is not an advanced science for expert reciters alone, rather it is an obligation upon each and every one of us whenever we recite the Qur’an. The Qur’an was revealed with Tajweed rules applied to it. In other words, when the angel Jibreel (alaihis salaam) recited the words of Allah to the Prophet Muhammad (sallAllahu ‘alaihi wa sallam) he recited them in a certain way and he showed the Prophet (sallAllahu ‘alaihi wa sallam) the ways in which it was permissible to recite the Qur’an. So it is upon us to observe those rules so that we recite it in the way it was revealed. At the time of the Prophet (sallAllahu ‘alaihi wa sallam) there was no need for people to study Tajweed because they talked with what is now known as Tajweed so it was natural for them. When the Arabs started mixing with the non-Arabs as Islam spread, mistakes in Qur’an recitation started appearing, so the scholars had to record the rules. Now, because the everyday Arabic that Arabs speak has changed so much from the Classical Arabic with which the Qur’an was revealed, even Arabs have to study Tajweed. The Qur’an is the word of Allah, and its every syllable is from Allah. Its recitation must be taken very seriously. 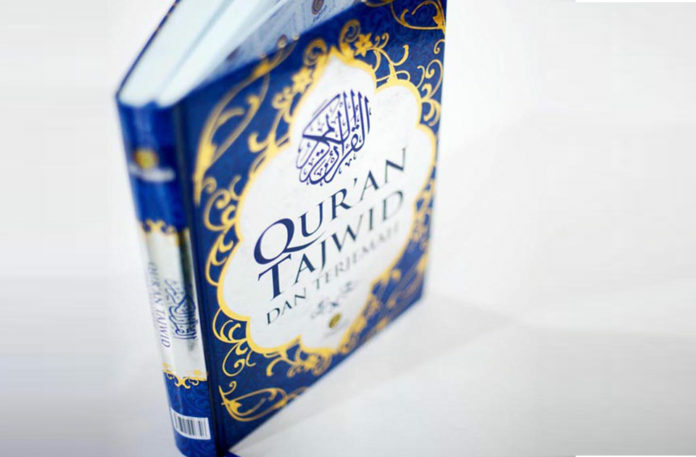 The purpose of the Science of Tajweed in essence is to make the reciter proficient in reciting the Qur’an, observing the correct pronunciation of every letter with the rulings and characteristics which apply to each letter, without any exaggeration or deficiency. And so, through this the reciter can recite the Qur’an upon the way of the Prophet (sallAllahu alaihi wa sallam) who received it from Jibreel who received it from Allah (subhanahu wa ta’aala) in the Classical Arabic dialect that it came down in. “It is required to observe all of the Arabic rules in that which changes it and ruins the meaning”. So he regarded it as an obligation to keep away from the major mistakes in reciting the Qur’an. Clear mistakes: which usually change obvious things and change the meaning. Unobvious (hidden) mistakes: for which one may need to study Tajweed rules. And the majority of scholars agree that applying the Tajweed rules of Qur’an such that the Clear Mistakes are avoided is an individual obligation (Fard ‘Ayn) upon every Muslim who has memorised part of or all of the Qur’an. As for applying all of the rules of Tajweed and avoiding the Unobvious mistakes then it is (Fard Kifaayah) upon the Muslim ummah. That is, there must be some students of knowledge who have knowledge of that. This is because the Qur’an was revealed with the Tajweed rules applied to it and the Prophet (sallAllahu alaihi wa sallam) recited it back to Jibreel in that way and the Companions of the Prophet (sallAllahu alaihi wa sallam) read it in that way, so it is an established Sunnah. The Clear mistakes must be avoided by all and to avoid them one must memorise and read attentively and have knowledge of some basic aspects of Tajweed. If a person falls into the Clear Mistakes, this is considered a sin and Ibn Taymiyyah even regarded it undesirable for a Student of Knowledge (i.e. someone who knows Tajweed) to pray behind a person who makes Clear Mistakes in their Salaah. As for the Unobvious mistakes, then the ruling on them is lighter and the recitation of a person falling into this type of mistake is regarded as lacking in completeness but prayer behind such a person is sound. Not observing the elongations (Madd) at all. Reciting them quickly as if there is no Madd so that they turn into the length of a vowel. Making a madd letter out of a normal harakah. Stopping or starting at an incorrect place so that the meaning is spoilt. Like stopping at ‘Laa ilaaha’ (There is no God), without completing ‘illAllah’ (except Allah). “at-Tarteel is Tajweed of the letters and knowing where to stop (correctly)”. Umm Salamah was asked about the recitation of the Prophet (sallAllahu alaihi wa sallam) and she described it as a recitation ‘clearly-distinguished letter by letter’. “How did he read it to you oh Aba Abdir-Rahman?” So he said “Lil Fuqaraaaa-i wal masaakeen”, he elongated the word Fuqaraa and the knowledge of the different lengths of elongation (mudood) is also from the rules of Tajweed. He would stop at the end of each aayah. ” He who does not recite the Qur’an in a pleasant tone is not of us.” Unfortunately all too often we find people reciting the Qur’an quickly and without changing their tone and without any feeling. Let us remember, that the Qur’an is the word of Allah. In it we find exhortations, warnings, glad-tidings, parables, stories of the past, commands and prohibitions. Aayaat to make us think, reflect, cry, fear, hope, love, fall down in prostration! How can we recite all of this without feeling!? When we recite an aayah of Qur’an we should imagine that we are trying to feel and convey the full message behind that aayah. Perhaps some of us don’t feel confident. I believe that this lack of confidence comes partly from not knowing the rules of Tajweed correctly and so fearing that we will make mistakes and partly from not understanding the meaning of what we are reciting. So let us work hard to remove these two obstacles by learning Tajweed and working towards learning Arabic. You must find a Qur’an teacher who has studied Tajweed to listen to your recitation and correct you. Tajweed cannot merely be learnt from books, because the movements of your mouth as well as the sounds are important and only a teacher can correct you and make sure you are applying the rules correctly. Sometimes local Mosques will run classes. Qur’an recitation is a science which was passed down generation by generation through teachers not just books, with a direct line to the Prophet (sallAllahu alaihi wa sallam). Find a book containing the rules of Tajweed and learn each rule little by little, applying it as you go along with the help of your teacher. There are many concise Arabic books and in English there are some books as well as tapes to help. Look for books with some drawings showing you how to pronounce each letter. Listen to Qur’an tapes of reciters who recite very clearly, at a medium or slow speed (like Sheikh Hudhaify or Sheikh Muhammad Hosary) and try and notice them applying the different rules of Tajweed. Repeat after them while trying to apply the rules you’ve learnt. Try to copy their tone and melody as well and see how it changes as the meaning of what they’re reciting changes. Tajweed Mus-haf: You can get a new Mus-haf (copy of the Qur’an), called Mus-haf at-Tajweed, which has the rules of Tajweed incorporated in the text of the Qur’an in colour coding! This is very helpful as it prompts you as you go along. There is also a computer program you can buy with it which highlights Tajweed rules with recitation. Tajweed Poem: If you know Arabic you could memorise Ibn al-Jazaree’s poem which contains all the rules of Tajweed. You can get the poem on tape sung as a nasheed in Arab countries. You might find memorising the rules easy in this way. Try and apply the rules you learn to the Surahs you have already memorised and don’t become lazy about reciting correctly. You might have to revise the surahs by looking back at them. May Allah help us all to give His Book its right when we recite it and make reciting it more beloved to our tongues than anything else. Aameen. Much of the factual information for this article has been taken from the book ‘Qawaa’id at-Tajweed’ by Dr. ‘Abdul Azeez Abdul Fattah al-Qaari’ a teacher of the Islamic University in Madinah. Published by Maktabah Dar in Madinah and from ‘The Prophet’s (sallAllahu ‘alaihi wa sallam) prayer described’ by Sheikh al-Albaani (rahimahullah). It was looked over and corrected by the brothers at abouttajweed.com in Saudi Arabia.